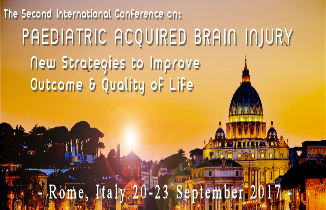 The International Paediatric Brain Injury Society (IPBIS) and the International Brain Injury Association (IBIA) are pleased to announce that the Second International Conference on Paediatric Acquired Brain Injury will be held in Rome, Italy, from 20-23 September, 2017. This event builds on the success of the inaugural Conference on Paediatric Acquired Brain Injury that was held in Liverpool, UK, in 2015. To view the on-site program for the 2015 conference, click here. Rome, Italy, 20-23 September, 2017- "New Strategies to Improve Outcome and Quality of Life"
Abstracts are now being reviewed and scored by the Scientific Programme Committee and will determine which abstracts will receive awards, as well as the most appropriate presentation format (oral or poster) for each accepted abstract. The deadline for submitting an abstract was 21 April, 2017. With the theme New Strategies to Improve Outcome and Quality of Life this Conference will focus on the development of new assessment tools, innovative therapies and devices, rehabilitation programmes, teaching strategies, psychological and social support, increasing the potential to recovery in young people affected by brain injury and giving, at the same time, support to the families. This list is not exhaustive and the organisers encourage all multi-disciplinary professionals involved in paediatric brain injury to benefit from this valuable opportunity to engage with experts, gain insights, and establish new collaborations. Evidenced-based research regarding the mechanisms of functional recovery and the efficacy of medical, rehabilitative and educational treatments, of children and adolescents with acquired brain injury. The varied causes of ABI in childhood, including medical conditions and non-accidental traumatic injuries. Development of advocacy protocols to support families of children and adolescents with ABI, towards affecting change at National and International levels. The role of advanced technologies in paediatric rehabilitation. How to improve Quality of Life of children with ABI and their families. New models of Service organizations and multi-professional supports for children and adolescents with ABI and their families. Multidisciplinary approach and team work in the management of children and adolscents with ABI. Strategies for improving speech and language performances. Click here to download the exhibit and support prospectus. If you are interested in exhibiting and/or sponsoring the meeting, please contact Megan Bell-Johnston at mbell@internationalbrain.org.